To address the safety hazard presented by poorly secured cargo, the Federal Motor Carrier Safety Administration (FMCSA) enacted rules known as the North American Cargo Securement Standard Model Regulations. The rules apply to any truck used to carry cargo across state lines. Cargo is defined as freight, which can be essentially any item with a structure or fixed shape, such as wood or boxes of electronics. All commercial truck drivers must follow these rules when securing cargo. In order to determine if cargo is properly secured, the FMCSA sets forth performance standards. These performance standards are determined by looking at how much deceleration and acceleration the freight can handle without significant movement. This also includes driving forward and in reverse and turning. 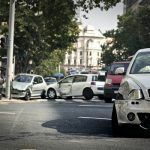 I’m Ed Smith, a Sacramento Truck Accident Attorney, with the primary accident information site on the web, AutoAccident.com. If you or a loved one has suffered a serious injury due to an improperly secured load, call me now at (916) 921-6400 in Sacramento or at (800) 404-5400 toll-free for fast, friendly advice.